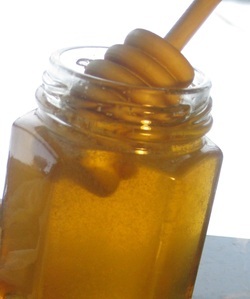 Honey is plant nectar that has been changed by bee enzymes into a thick sweet substance. Basically, the bees spend all spring and summer visiting flowers and drinking their nectar. (In exchange, they aid the plants by transplanting their pollen from place to place.) They swallow the honey, let the enzymes in their stomach work on it, and then regurgitate it into the honey comb. This is why our family affectionately calls honey "bee vomit." The bees use their wings like a fan to evaporate the moisture in the honey and then they seal the honey comb with beeswax. The honey is then stored like that until the bees need it... or a beekeeper comes and claims it. Just so you know, the bees produce much more honey than they need, and we always leave plenty for the bees. To see some pictures of extracting honey, click here. For more information about honey, click here. If you are interested in keeping bees and would like some information, click here.